If you are looking for the perfect dressing for Thanksgiving, you are in the right place. 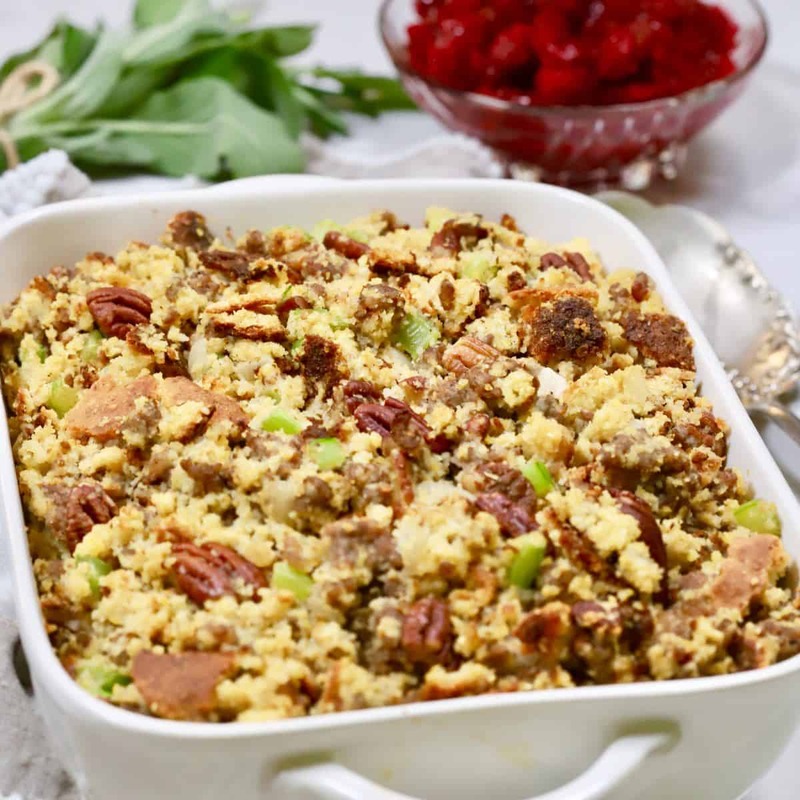 Southern Make Ahead Cornbread Dressing with Sausage is the perfect dressing and a perfect Thanksgiving side dish. It’s perfect because it’s delicious, it can be made ahead, it freezes beautifully, it’s simple and easy to make, and, did I mention when it’s cooking the aroma wafting through your house is intoxicating! Make Ahead Cornbread Dressing with Sausage was my Mom’s recipe, and I can still see her now on Thanksgiving mixing all of the ingredients in a big bowl and trying to keep me and my brothers and sisters from trying to sneak a piece of crusty cornbread, tasty sausage, or a toasted pecan. For me, it epitomizes Thanksgiving, and all that is good about it. Every time I make it, it brings back many happy memories. Since my Mom is no longer with us, it’s our family’s tradition for me to bring our favorite dressing to our Thanksgiving gatherings and I have done so for many years now. Stress-Free Thanksgiving Tip # 2: About two weeks before Thanksgiving, check to see if you have everything you will need for the big day, i.e. meat thermometer, turkey baster or brush, large roasting pan, roasting rack, serving dishes, kitchen twine, etc. 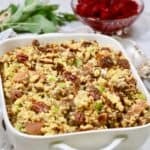 To make this yummy dressing, all you need is cornbread, onion, celery, sausage, toasted pecans, chicken or turkey stock, egg, and poultry seasoning. You can make the cornbread yourself, which I always do (check out my recipe for Old-Fashioned Southern Cornbread), or you can buy cornbread already made. Around Thanksgiving, most grocery stores have it available. Just don’t buy the sweet stuff or get me started about whether you should put sugar in cornbread. That’s a whole other post. 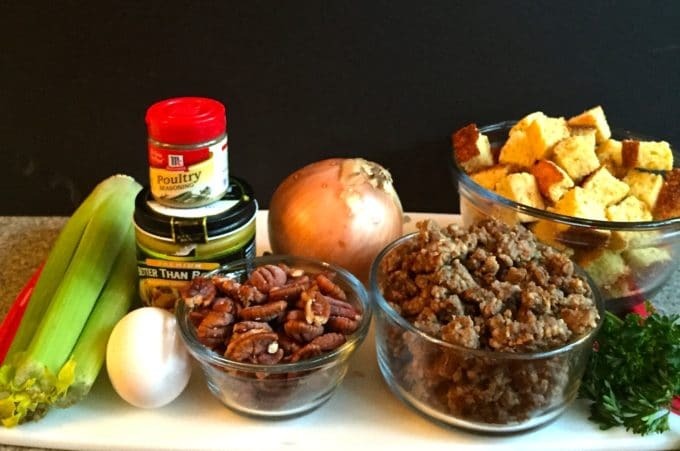 If you are ready to make this delicious Make Ahead Cornbread Dressing with Sausage, gather your ingredients and preheat the oven to 400 degrees F.
To toast the cornbread, cut it into small cubes or crumble and place on a baking sheet. Place it in the oven and toast for 8-10 minutes or until the cornbread is light golden brown. Mix 1 cup of the chicken or turkey stock and egg together in a small bowl until well blended. To bake, cover the baking dish and bake for 35 minutes. Uncover and bake for an additional 10 minutes or until the top is golden brown and crusty. Serve immediately. Bonus: If your turkey has giblets, it’s easy to make turkey stock. Simply place the giblets and 3-4 cups of water in a medium-size saucepan, add about 1 tsp salt and pepper and bring to a boil over medium-high heat. Reduce the heat to low, cover and simmer for about 45 minutes. Remove the giblets. Voila, turkey stock! 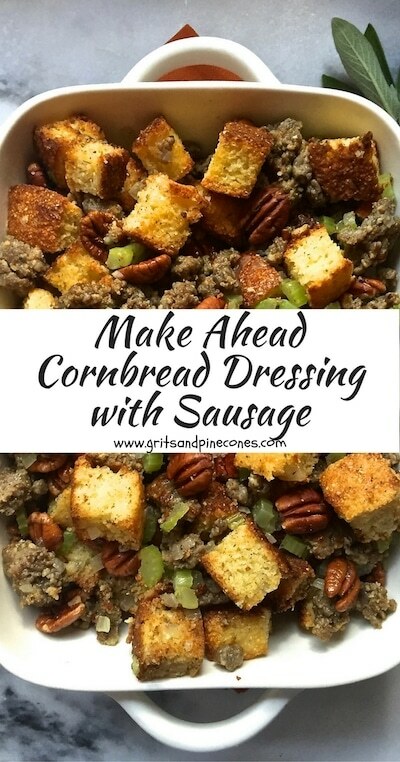 Did you enjoy going through this Make Ahead Cornbread Dressing with Sausage recipe? Why not create it for the family? Looking for more Thanksgiving recipes? Check these delicious choices out 27 Amazing Thanksgiving Desserts, 15 Spectacular Sweet Potato Recipes and 10 Best Turkey Recipes for Thanksgiving. 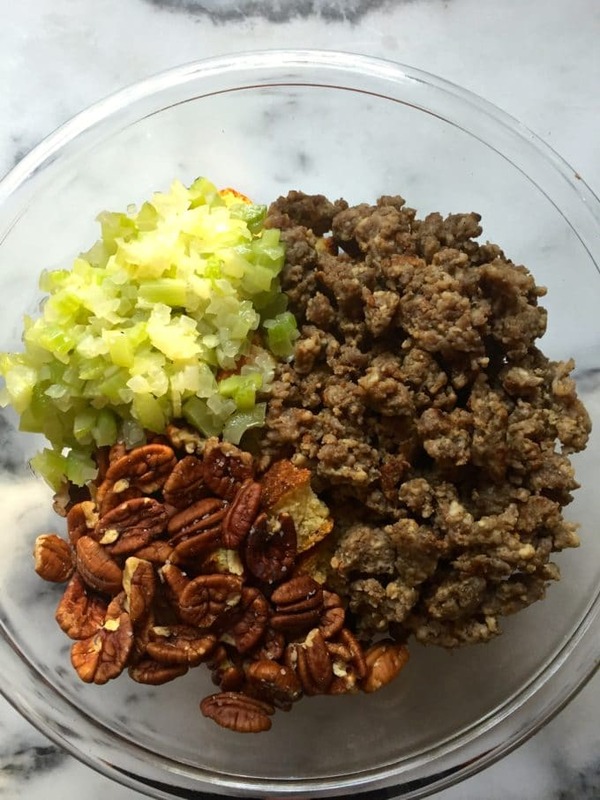 Southern Make Ahead Cornbread Dressing with Sausage is a perfect Thanksgiving side dish. It's delicious, it freezes beautifully, and it's simple and easy to make! If your turkey has giblets, it's easy to make your own turkey stock. Simply place the giblets and 3-4 cups of water in a medium-size saucepan, add about 1 tsp salt and pepper and bring to a boil over medium-high heat. Reduce the heat to low, cover and simmer for about 45 minutes. Remove the giblets. Voila, turkey stock! Love that you can make this ahead of time, you seem to be a very organized person. Great pics!!!! If you make it ahead and freeze, do you cook on thanksgiving straight from freezer, or thaw ahead? If straight from freezer, what time & temperature? 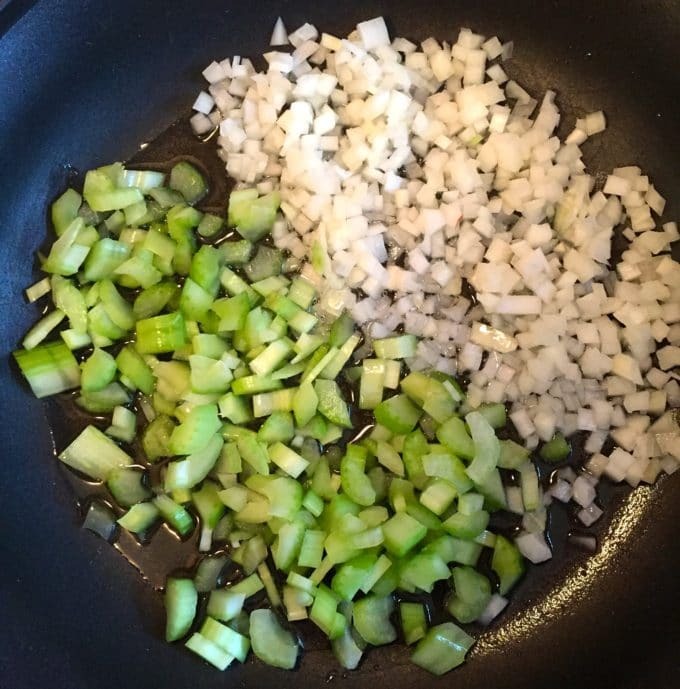 If you make this dressing ahead of time and freeze it, make sure to wrap it tightly so no air can get in. Also, I wouldn’t freeze it for more than a few weeks before Thanksgiving. I recommend taking it out of the freezer the night before and letting it thaw out in your refrigerator and then just following the recipe directions for baking it. Sometimes when you try to cook a casserole that is still frozen the sides dry out before the center is cooked so it works better to let it thaw. If it looks dry, sprinkle a tablespoon or two of water or chicken broth over it before you bake it. Good luck and let me know if there is anything else I can help with.